Would we walk among shadows? Edited by Rolandscribe at 08:13, 09 Mar 2007. Might and Magic VIII- officially the best game there is. And that, is a scientific fact. Edited by Stella at 13:18, 25 May 2007. -- I loved M & M 7 the most (and I still like it very much). The world was huge, the spells (especially the dark spells) were fantastic and the complxity and those many quests made it even better. -- Too bad that it won't run on my PC now. I CAN install it but when I start the game the screen turns black and nothing happens and eventually the game crashes... anybody has a patch for M & M 7 that might make it work on a P4 3 Ghrz with 1 Giga RAM? -- If U do please PM me. THX. ( " " )/ Lady! 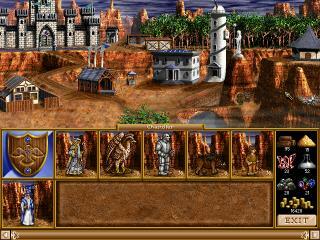 Shame on me, I've never played any of the Might and Magic games. (I'll rent one from the library) How do they work? is it vaugely like Dark Messiah, more like WoW, similar to Pokemon? Is it all campaign based, or is it an open ended thingy? Nothing like Dark Messiah really. You move with the arrow keys and attack with the letter A. You level up by killing and doing quests, which are gained from people in houses. That's pretty much it, you'll figure out the rest. You can upgrade your initial attributes through potions and other means.. In might and magic 8 (the best game there is ) your race and class are mutually exclusive. You choose between knight, cleric or necromancer (all human), dark elf (a rogue/archer type character), minotaur or troll (both tanks, minotaur can get minor healing spells), vampire (daggers and vampire magic, some healing spells also). There are also dragons but they are overpowered, you can pick them up later on (cant start with them) they are pretty much just a tank also. MM9 is a joke though. They tried to make it better by upping the graphics and the 3D capabilities (which are questionable in the previous games ) but just ruined it. "...starcraft bad... m&m good... riiiight..."
@TA: thanks. I think I will check out these games. First MM7 thread I came across. So some necro bump. I just restarted my game, knight, thief, archer and sorcerer set up. Really loving the game, the texture looks like wet crap, but something about it makes me want to carry on. Also, can anyone explain to me why everyone is so god-damned ugly? Every woman in Harmondale is either overweight, ridiculously old, or has other facial deformation, (despite the fact that they look like attractive red-heads before being talked to). I mean sure, peeps back in those times weren't models like in some modern RPGs, but seriously, overweight and deformed weren't the only things either. Also, can anyone explain to me why everyone is so god-damned ugly? Every woman in Harmondale is either overweight, ridiculously old, or has other facial deformation, (despite the fact that they look like attractive red-heads before being talked to). Some of the standard NPC's looks pretty decent in my opinion. I remember the first time I found one the uglier ones and thought to myself "NOT HIRING!!". Btw. may I ask why did you choose the standard Knight, Thief, Cleric, Sorc party and which path are you going to follow, if not both? #1 Monk, Druid, Sorc, Archer with focus on Endurance & Might & for the Archer, Speed. Monk invests 50/50 in Unarmed & Bodybuilding and is there because he's awesome for early and mid game. Druid for elemental focus and the ability to get the good clerical spells early as well. Archer gets all horseshoes and genie lamps for more points in his bow skill, gonna go for Lands of the Giants before April (or is it May?) for double harvest of Genie Lamps from there. The idea is to get through the game the old fashioned way without using invisibility and hold back on promotion quests. Then simply follow the main quest line. Slaying the dragon on Emerald Island with clubs. Go through Castle Harmondale via a Piper & Bless-dude. Detour through Erathia (protection from magic scroll) for Bracada before reaching the Dwarf King. Clearing out Bracada Desert and get some Genie Lamps. Getting those +7 to all elemental skills (Sorc, Druid, Archer) for an easy passage through the mines and also use the protection from magic scroll to clear out the Medusa's. Go to Barrow's down and fire an Armageddon scroll bought in Bracada to eliminate most of the opposition there. Go through the Nighorn tunnels via +7 water magic and also clear out the first part of the Nighorn Mountain, by taking advantage of the slow hit recovery of Minotaurs and long range of spells. Go through the Tunnels to Eofol via protection from magic, flesh to stone (potions from the dwarf mine + spell) and clear out the Behemoths by taking advantage of that they get stuck. Harvest Genie Lamps over 2 times in Lands of the Giants. Once the war has finished, clear out Land of the Giants via Sorc's Armageddon. The only thing that's holding me back is that I wanna buy both an Armageddon scroll, a +Disarm item (helpers aren't enough) and I'd also really like a wand of Shrapmetal in Bracada Desert. Only 1 thing is feasible and I already dislike reload when I don't get what I want in the shops. I could exploit the body bug on the Emerald Island Dragon, but that's a way I'd really like not to go, hence I probably won't play through with these guys. Not that it really matters, the only thing I haven't tried is to go through the Tunnels of Eofol without invisibility at a really low level yet. #2 Paladin, Paladin, Paladin, Cleric. Cleric for GM protection from magic, GM rejuvenation and GM light magic, also the early spirit magic. The Paladins focus 50/50 in Mace & Body Building, gets maxed via the well in Land of the Giants, for extreme paralyze (their paralyze attack is permanent, unlike that of the light magic school). But to be honest, I'm afraid the second team isn't gonna be much fun, the Paladin is nothing special before he starts paralyzing stuff, his mana & magic is lower than the difficulty he's on for the given promotion and his health makes him fragile. First at the final stages are he gonna be awesome, and then all there's left is to clear out Land of the Giants without using Armageddon, the few last couple of quests. Edited by Tsar-Ivor at 23:13, 16 Jun 2014. Went for a standard Knight for might, thief for disarming (yeah all those chest suicide experiments with booby traps are finely burned into my skull). Sorcerer because I don't want to rely on archer air, I want someone who specializes in elemental magic. And archer for that ranged accuarcy, since archery is a big thing with me. Though note that this is based on my pre-feel for the game, I'll likely restart once I find out all the intricate parts of how the game works. Also, I'll probably try and stay away from the paladin-quest exploit that me and my bros found by accident. If you sleep in the dragon cave while the "main" dragon is still alive, then some dragons will spawn (at least 1) and will be stuck by the entrance. You can whack them endlessly from safety, then just save and farm the loot for artifacts. Edited by OhforfSake at 23:30, 16 Jun 2014. For some reason I thought you wrote cleric, not archer..
With Haste (if it works in your version.. I think potions have the best chance of working, orange + red) (-25), of Darkness / Swift (-20) and speed mod only 25 in the Speed stat should be enough to hit max attack speed with the Mace. The Mace however hasn't really got that many cool artifacts, e.g. there's a Sword that gives freaking +10 to Armsmaster, and I think I once calculated that there's enough bonus to Armsmaster skill in the game that a Knight hunting Dragons and Titans can reach max (60) Armsmaster skill despite only sinking something around 7-15 skill points into the skill, for max speed, +120 damage, etc. I think the most potent weapons however, apart from clubs which are OP, are daggers and for the late knight a spear. If all skill maxes out (probably requires cheapness via the well) a knight can reach ~300 damage pr. swing with maxed speed, not to mention the highest amount of hit points in the game, iIRC it's even greater than that of the Dragon in MM8, not sure if it beats that of the Troll though, I can hardly remember how it goes. But I prefer Monks over Knights because in the early and mid game I find the Monk superior to the Knight in both Damage, Speed and survivability, if only barely. I generally don't like to mix might with magic though. 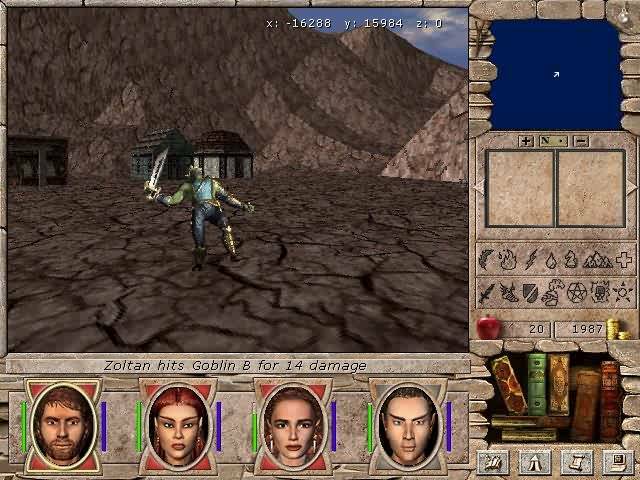 The way I see the game has 2 combat options, DnD style turn based, and real time. Turn Based is great for casters, because it allows all their spells to be readily used in stead of a single quick spell or many breaks during battle. I don't find turn based specifically good for melee fighters, though I believe there's a bug in MM8, where the monster gets in eternal hit recovery somehow in turn based mode. Also turn based means you can easily hit non-shooting targets who usually dodge your projectiles. For real time, I think both magic and might is great. With might one can take advantage of range, attack and slowly move back, while many monsters suffer from hit recovery (such as Minotaurs), or using quick spells with magic heroes, especially wands of shrapmetal or the shrapmetal spell is awesome once it comes to close quarter fighting. But that's also why I generally prefer not to mix might with magic, because I don't think the might classes has that much to offer the magic classes, which on the other hand, apart from the Cleric, can do might and magic rather well thanks to daggers. So I'd e.g. not take 2 non-magic types such as both the thief and the knight. For disarming purposes I'd simply buy an item with +disarming skill in Bracada Desert / Deyja magic guilds for someone with the Disarm Skill (such as an Archer) and for later levels use Telekinesis (but I don't like to use invisibility, where you'd rather have GM disarm ). On the other hand, I think the thief quest line is one of the, if not the most challenging of them all, especially the first promotion quest. The quests I however like the most are that of the Paladin and the good path for the Ranger. When I played the game years ago I never figured out how to rest other places than the tavern, so my characters would always be on the edge of insanity. Yeah, spawning Green Dragons is possible, but I've never seem them getting stuck though. I can always delete my ramblings if that turns your frown upside down. Thanks. ^^ But I think I've written better stuff about M&M earlier. What? and you haven't got a QP from them? Unless I get 5 more qp's I don't really see the point. If I feel like writing about something, I'll do so. Otherwise I should of course get at least 1 qp for each and every post I make. I've written so much informal stuff about the female uterus. Like that it doesn't look very pretty and stuff. I'm thinking of re-playing 6-8. I'm not sure which one to start with, and if there are good mods around. Been ages since I touched them! My preference goes to 6 in terms of content and how vast it is. But my preference also goes to 7/8 in terms of better combat system. There are MODs for MM6 and MM7. Yup! Thanks for the link. I'm still thinking on which one will start. Also I'm thinking whether I should pick up HoMM again or not; it has been so many years...I grew up on this game since HoMM1 to 5.